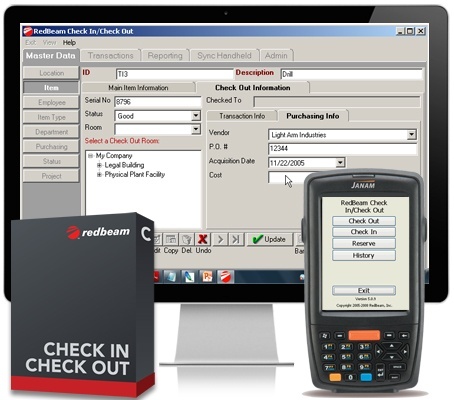 RedBeam Check In/Check Out comes in two versions, standard and mobile. The standard editions of the software allow for data collection using cabled barcode scanners attached to PC workstations. The mobile editions allow for data collection using cabled barcode scanners attached to PC workstations as well as the ability to collect data on scanner-enabled mobile computers. This powerful fixed asset tracking solution supports Windows XP, Server 2003, Server 2008, Vista and Windows 7. The standard edition of this powerful check in check out is a complete item database with the ability to use cabled barcode scanners attached to PC workstations. You can enter employees, members, customers or students into the system, and then track equipment, tools, or files by checking them in and out using a cabled barcode scanner. You can easily report on which items are checked out and to whom. Monitor overdue items, rental fees, item usage and more. The mobile edition of this powerful check in check out software is a complete item database with the ability to use cabled barcode scanners attached to PC workstations as well as the ability to collect data on scanner-enabled mobile computers. RedBeam Check In/Check Out includes unlimited mobile computer licenses for compatible mobile computer models. You can enter employees, members, customers or students into the system, and then check items in and out to them using the barcode scanner. You can easily report on which items are checked out and to whom. Monitor overdue items, rental fees, item usage and more. Cabled barcode scanners are ideal for scanning at a PC workstation. Mobile scanners are ideal for applications that require scanning wherever items are found. Cabled scanners connect to your PC workstation. When scanning a barcode, the scanner transmits data to the application you are working in just as if you had typed the information. RedBeam software applications work with any USB cabled barcode scanner.